The first three episodes introduced us to a bunch of people, and I could barely keep them straight in my head. Well, we’re already in a new arc, and as a result, there are now more new faces to pair with new names. This is going to be painful. 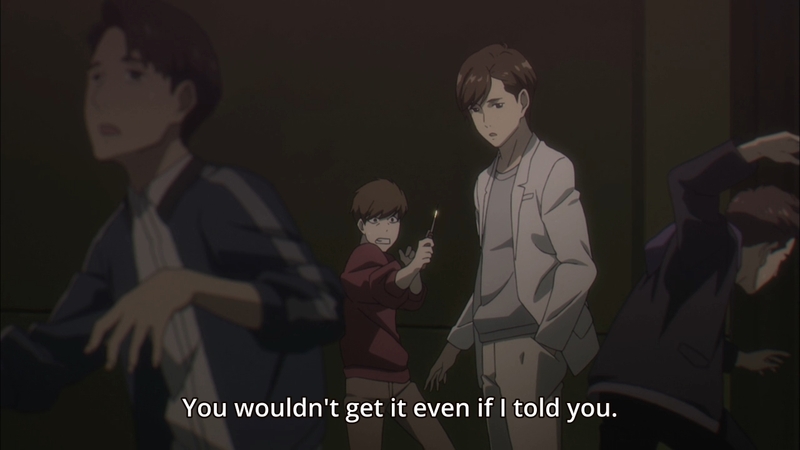 At the very least, Boogiepop is back, and maybe Nagi will show up at some point, too. 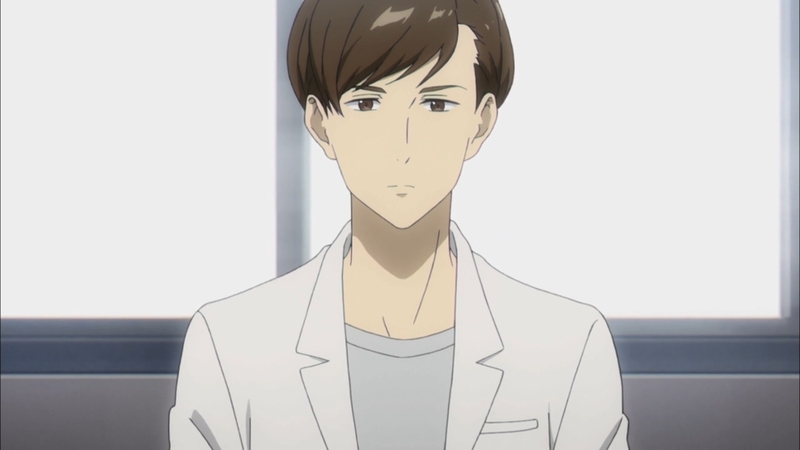 But for the most part, this episode concerns itself with a guidance counselor by the name of Jin. Normally, he listens to his students and this is enough to comfort most of them, but he has another trick up his sleeve — a trick that up until now he hasn’t tapped into. When Jin looks at people, he can see the core of who they are as some sort of metaphysical flower. According to the guy, everyone is flawed in some way. No one is entirely perfect, so no one is every entirely happy with their lives. Okay then. So why is this important? One day, Jin bumps into a mysterious girl floating in the middle of the streets. He’s the only one who can see her, though. She also starts spewing cryptic nonsense at him like how she can see people’s energy right before they die, how she is the enemy of the world because she intends to reshape it, so on and so forth. Seriously, I have no clue what she’s talking about. 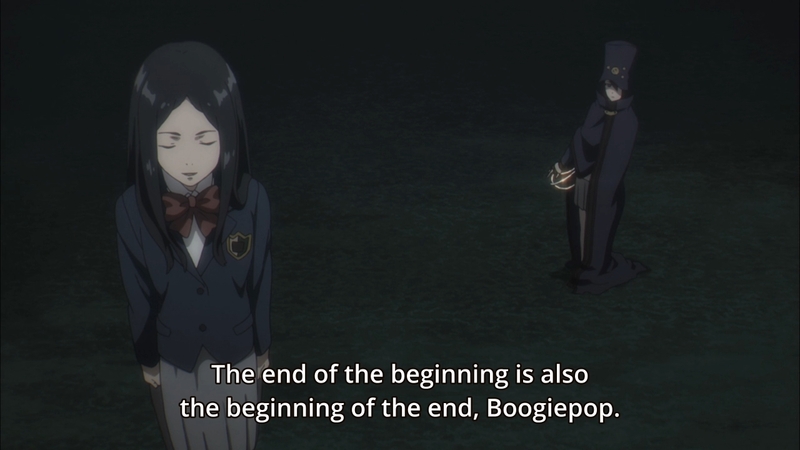 All we know is that Boogiepop refers to her as the Imaginator. Yeah, even that name doesn’t really shed any light on the girl’s aim. Sure, she wants to reshape the world, but in what way? And to what end? Nevertheless, from this point on, she begins to haunt Jin. 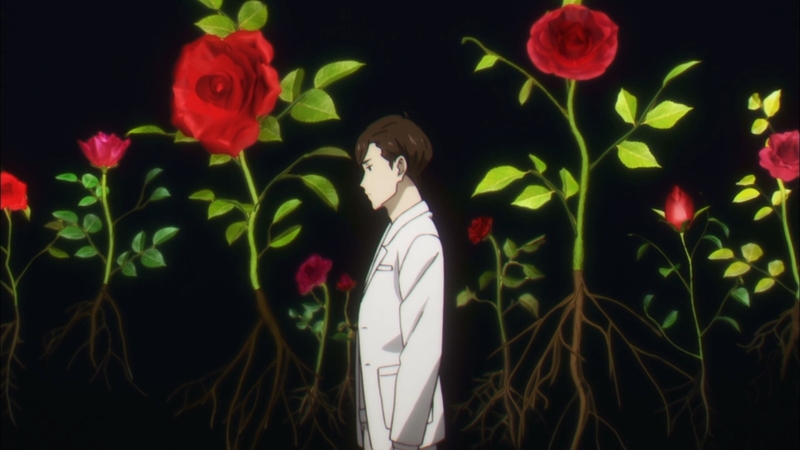 She shows him a glimpse of a possible future in which he goes from person to person, touching the flower within them in a rather violent fashion. Obviously, she wants to use his powers in order to aid her cause, but again, I have no clue what that cause is. Jin is initially resistant to the Imaginator’s temptations, because honestly, what’s in it for him? Even if he really wanted to touch people’s hearts, what does this do for him? What would he even get out of this? Well, he’s about to find out. 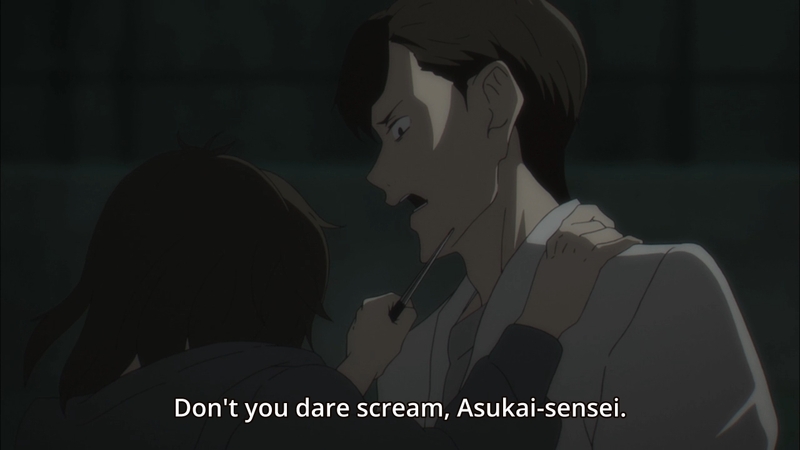 One night, a former student of his pulls a knife on him and demands his money. She’s in terrible shape, and it’s obvious that she has a drug addiction. That’s when the Imaginator possesses the girl and starts going on and on about how the poor girl’s going to suffer, but at least Jin can do something about it. Right before the Imaginator leaves the girl’s body, she slits the girl’s throat. 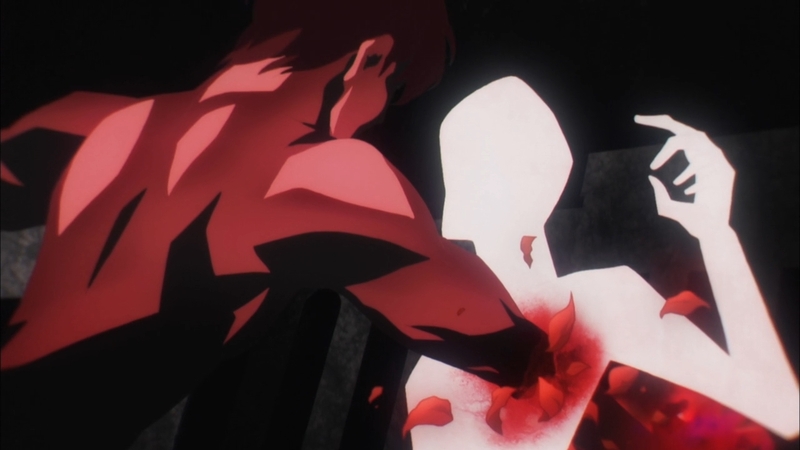 As his former student slowly dies in his arm, Jin feels as if he has no choice but to ease her pain. 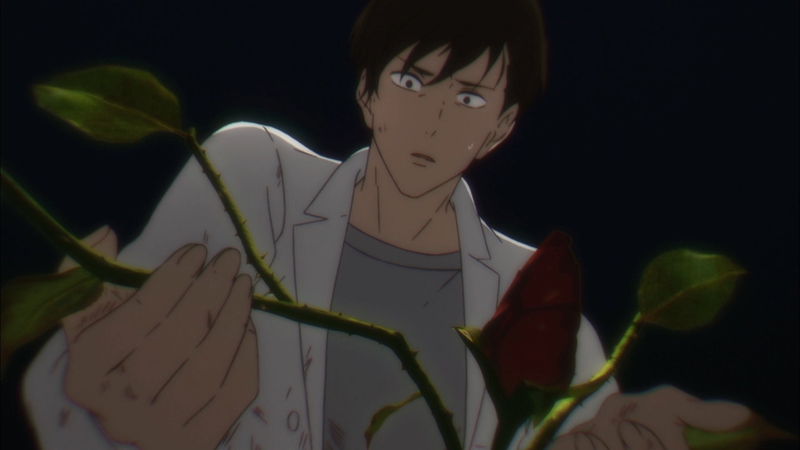 As a result, he reaches into her heart and touches her flower. We are later told that she had died peacefully. So that’s it, huh? This seems to have triggered a major change in Jin’s personality. Maybe he was dissatisfied with his line of work before now. Maybe he felt like he was a fraud. He’s supposed to be a guidance counselor, but he never really offers his students any sort of substantive advice. He just tells them platitudes like don’t stress yourself out too much, keep on pushing forward, blah blah blah. 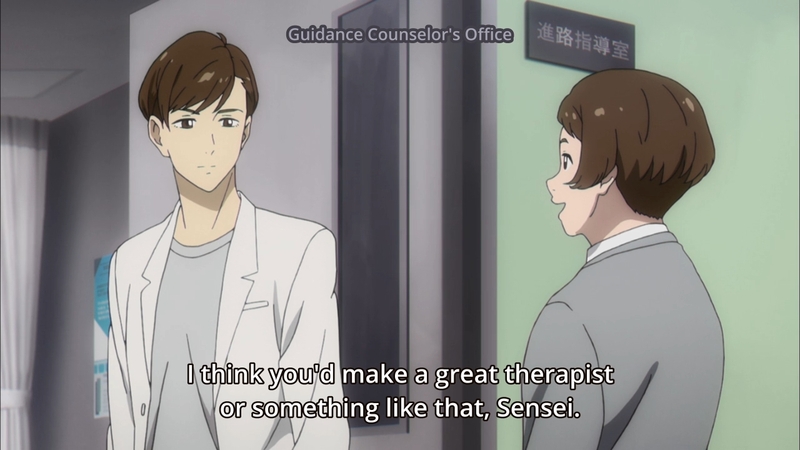 When one of his students suggests that he should consider becoming a therapist, the guy has to take pause. I imagine it’s because he knows he can’t actually hack it. He can’t actually help his students resolve their problems. At best, he’s a pain reliever; he’s a temporary solution. But now that the Imaginator has convinced Jin to reach into people’s hearts and manipulate them, maybe he can now become who he’s always wanted to be. She kept tempting him with the idea that this was his calling. When we next see Jin, he comes across three bullies attacking a couple in an alleyway. He tells the couple to run off, because he’ll take care of the bullies himself. Before we know it, two of the bullies have had their hearts “touched” by Jin. Do they look happier? Or do they look as though they’ve become zombies. 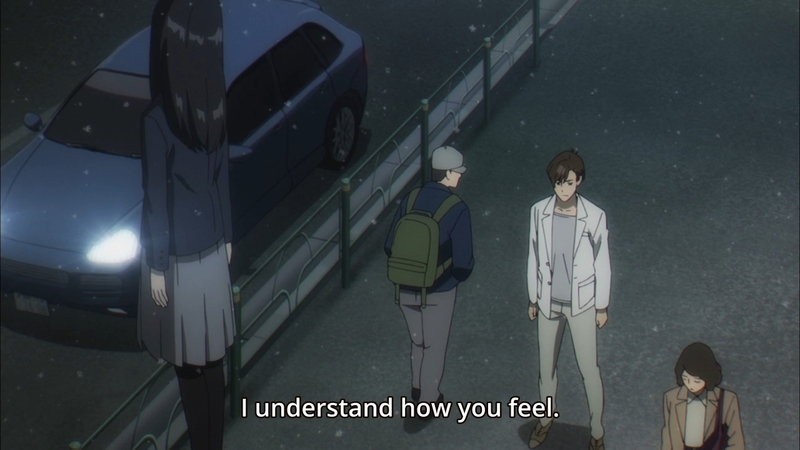 Obviously, Jin is not actually helping anyone, but he believes that he is. Moreover, it’s clear that he’s now more receptive to what the Imaginator has to say. We just still don’t know what she’s really after. Like yeah, I can imagine how Jin’s powers might be useful in helping her reshape the world, but reshape it into what? Ah well. What makes this extra infuriating is that the first three episodes tell us exactly what to expect next, which is that we’ll probably spend the majority of the fourth episode with more new faces. That couple that just ran away? I bet they’re important characters in this arc. I bet Jin will now fade into the background. Sigh. So yeah, that’s the fourth episode of Boogiepop wa Warawanai. What’s the theme here? Well, there’s clearly more than one way to be happy. You can either fix your flaws but that’s difficult, or you can strip yourself down until you no longer care about your flaws. This appears to be what Jin has done to his victims. Can he really solve people’s problems? Or does he just remove their autonomy? Does he simply turn them into mindless simpletons in order to simplify their lives? After all, we’d all be a lot happier if our lives were simpler. But at the same time, we can’t really find any fulfillment in that. Quick fixes never work. If I have to guess, I bet that Jin’s ability to touch the flowers within people will prove to be hardly any better than the empty advice he offers. 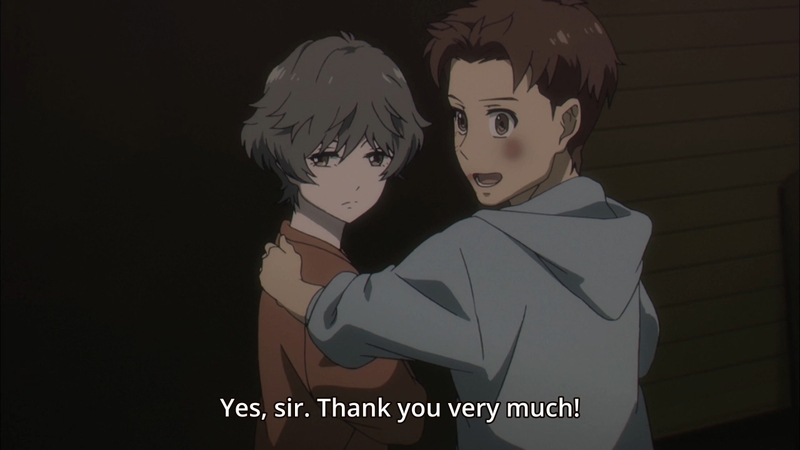 Previous PostPrevious Yakusoku no Neverland Ep. 2: What pairs well with orphans?